Do you work at The Faltering Fullback? What did you think of The Faltering Fullback? 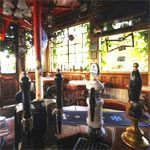 There’s more to this leafy suburban pub than first meets the eye, making it a much-loved staple for many north Londoners come the weekend. You’ll be hard pushed to find a pub that makes better use of its small space. The Faltering Fullback looks like a tiny country inn from the outside, with its creeping vine adding to the bucolic effect. 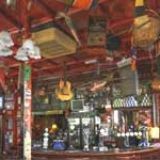 The illusion is shattered once you set foot inside a pub that spreads itself across three large sections, and hides a multi-layered beer garden at the back. The horseshoe bar arches across two old-fashioned rooms, decked in wooden walls and rafters. And behind some doors to the right is a large hall with bench seating that is never short on custom. TV screens cover each wall and a jukebox is fought over. 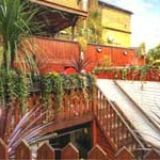 The aforementioned beer garden is one of London’s best, thanks to its many tiers and walkways, and its abundance of decking and shrubbery – it’s of no surprise that it’s drawn many a comparison to a certain Return of the Jedi Ewok village, then. Never short of footfall, the Faltering Fullback fills up nicely on a Friday night and true to its name, is chock-a-block when the rugger is on and indeed when Arsenal are on the pitch, being set just round the corner from the Emirates Stadium. Nor are cricket, golf and tennis overlooked on the large TV screens, where keen fans gather round to watch the action. 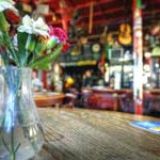 A Monday night pub quiz proves popular as well, and with each regular team’s ranking placed on the pub’s website, there’s glory in the game, too. This all adds up to one hell of a buzz in the pub, but young female bar staff may not appreciate all the custom through the door on a Friday night and are unlikely to raise a smile for you unless you’re a true regular. Tien Tong Thai kitchen is attached to the Faltering Fullback, providing green curries and the like to hungry punters. Food is fairly authentic and at a reasonable price point too, with a large and flavoursome bowl of red curry and rice costing you just £5.90. Pad Thai and Massaman curry can be ordered at the bar, as well as a menu of lesser-known Thai curries for £7.50, including a scary sounding pataya explodent. As you’d expect from a pub where sports is big on the agenda, lagers are in excellent supply. 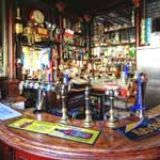 Expect Fosters, Heineken, Stella and Kronenbourg all out on force, while seasonal ales will please the rugby crowd. As with the food, prices are kind on the purse strings, another reason for the pub’s loyal local following. 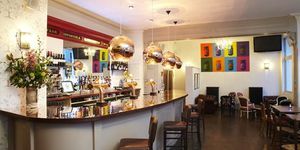 A lively atmosphere complete with sports screenings, budget-friendly prices and one of the best beer gardens in London make the Faltering Fullback a firm Finsbury Park favourite.